Our 2017 Benefit Concert took place at the beautiful Palace of Fine Arts Theater on April 9, 2017. This year we celebrated The 70s, and featured music from three exceptional decades—the 1770s, 1870s, and 1970s. The 1770s represented the heart of the Classical period and produced chart-topping hits from the likes of Mozart, Haydn, and Salieri. The 1870s featured some of opera’s iconic pieces like Bizet’s Carmen and Verdi’s Aida. The decade also marked the beginning of the incredible partnership between Gilbert and Sullivan. The 1970s gave us incredible Broadway shows by Stephen Sondheim, Kander & Ebb, and Andrew Lloyd Webber, a fabulous period for Motown Records, not to mention countless rock masterpieces by Led Zeppelin, Aerosmith, and SFA-favorite, Queen. Soprano Marnie Breckenridge is captivating international audiences with roles ranging from the Baroque and Bel Canto to Modern. Her passionate interpretations of contemporary works include: Mother in DOG DAYS by David T. Little where the NY Times praised Breckenridge’s “lovely soprano” and TimeOut Magazine voted it Best Opera 2012, Sierva Maria in Peter Eötvös’s LOVE AND OTHER DEMONS (Glyndebourne Festival Opera), her Berkeley Symphony debut in Chin’s CANTANTRIX SOPRANICA with Kent Nagano, and her Ravinia Festival debut in Jake Heggie’s TO HELL AND BACK with Philharmonia Baroque, co-staring Patti LuPone. Of her performance at Ravinia noted by reviewer John Von Rein, “she sounded as gorgeous as she looked, achieving both lyrical poignancy and dramatic power” (The Chicago Tribune). Breckenridge made her Carnegie Hall debut singing the soprano solos in Mozart’s CORONATION MASS last spring. Other recent concert work includes soprano soloist in EIN DEUTSCHES REQUIEM and CARMINA BURANA (SF Choral Society at Davies Symphony Hall). As a favorite soprano of contemporary composers she has recorded songs and performed works by Robert Paterson (Summer Songs), Luna Pearl Woolfe, Missy Mazzoli, David Conte, David Garner, Martin Hennessy, Henry Mollicone, and many others. Niki Haris, is a celebrated singer, dancer, songwriter, and choreographer. She is the daughter of Grammy-nominated jazz pianist Gene Harris, and she certainly inherited his talent for music and performance. This dynamic woman has worked with a multitude of recording artist ranging from Pop, R&B, to Jazz. Her live performances and recording experience reads like a who’s who of the music world: Ray Charles, David Sanborn, Patrice Rushen, Michael Sembello, Leann Rimes, Michelle Branch, Santana, Kylie Minogue, Luther Vandross, All Saints, Wilton Felder of the Jazz Crusaders, Stanley Turrentine, the Righteous Bros., Julian Lennon, Anita Baker, Mick Jagger, Whitney Houston and Madonna, with whom she recorded and toured for 18 years. 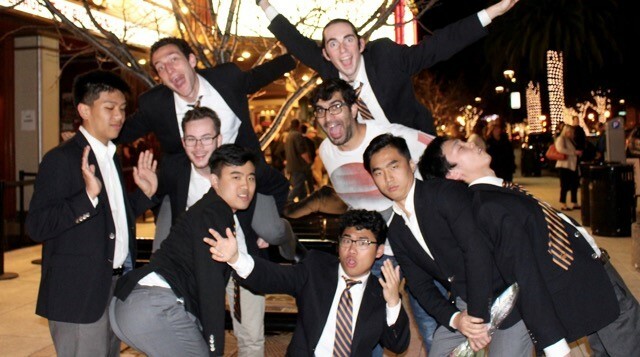 The UC Men’s Octet is an eight member a cappella singing group comprised of some of the finest male singers at the University of California, Berkeley. Founded in 1948, the Octet has entertained audiences around the world with its unique mesh of close harmonies and zany stage antics. Dazzling fans with wide repertoire of barbershop, doo-wop, contemporary pop, modern alternative, and of course, Cal fight songs, the group has released dozens of recordings over the years. The Octet is also the only two-time champion of the International Competition of Collegiate A Cappella.